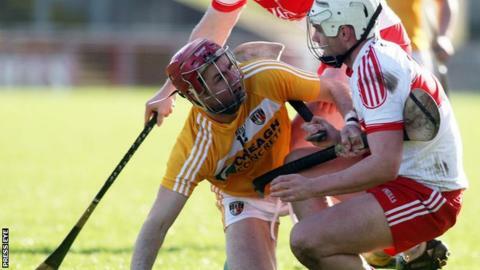 Antrim fought back from five points down at half-time to earn a 2-21 to 2-12 win over Derry in Sunday's Division Two A Hurling League opener. Six Ruairi Convery points helped Derry lead 1-8 to 0-6 at half-time with Gareth O'Kane netting on 16 minutes. However, the Saffrons were ahead within 13 minutes of the restart after a goal from league debutant Donal Nugent. Antrim moved seven ahead at one stage and Convery's injury-time goal was mere consolation for the Oak Leafers. The game saw the Saffrons in Division Two action for the first time since 2003 after their annus horribilis last year when they suffered championship and league relegation. A losing start looked in prospect for the Saffrons, under new manager PJ O'Mullan, as Derry led by five at the break. Two long-range Convery frees gave Derry an early lead as Liam Watson, back to league duty after a four-year absence, was off target from a couple of placed balls. Points from Ciaran Clarke and James Black did bring the Saffrons level but O'Kane's 13th-mninute goal helped Derry move into a 1-4 to 0-3 lead. With Shane Farren contributing a couple of fine points, Derry moved five ahead by the interval but the game turned swiftly in Antrim's favour in the 13 minutes after half-time as the Saffrons hit an unanswered 1-4. Nugent flicked a Kevin McKernan long ball to the net to put Antrim ahead for the first time in the 48th minute and with Conor Johnston, Clarke, McKernan and Saul McCaughran among the scorers, they moved into a 1-18 to 1-11 advantage with a couple of minutes left. Convery's injury-time goal cut Antrim's lead to four but the Saffrons still had time to respond with three more points. Meanwhile, Down edged out Armagh 2-16 to 2-14 in the Division Two B Ulster derby at the Athletic Grounds. Three Danny Toner points helped Down take a 0-6 to 0-3 lead but Armagh responded with an unanswered 1-3 which was highlighted by John Corvan's goal. However, Toner's goal just before half-time contributed to Down taking a 1-9 to 1-8 lead at the break. Points from Conor Woods, Caolan Bailie and Scott Nicholson helped Down move four clear before a Woods' sideline puck flew directly into the net in the 57th minute to extend the Mourne County's advantage to 2-14 to 1-10. Helped by Corvan's goal, Armagh outscored Down 1-4 to 0-2 in the closing stages but it proved too late for the home side. Derry: D McDermott, E McGuckin, C McSorley, S McCullagh, D McCloskey, P Kelly, D O'Neill, O McCloskey, T McCloskey, J O'Dwyer, M McGuigan, G O'Kane, S Farren, R Convery, A Grant. Subs: C Gaile, M McGrath, B Quigley, B Douban, D Foley, B Laverty, J McCullagh, M Conway, N Farren, R Leonard, T Magee. Antrim: C O'Connell; O McFadden, N McAuley, C McKinley; S McCrory, Ciaran Johnston, B McFall; K McKernan, D McKernan; E McCloskey, D Nugent, L Watson; Conor Johnston, N McKenna, Ciaran Clarke. Subs: G McTaggart, B Graham, C McCann, D McCloskey, D Hamill, S McAfee, J McGreevy, J Connolly, J Black, M Bradley, S McCaughan.